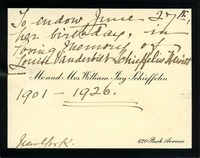 Mr. and Mrs. William Jay Schieffelin write to endow June 27, the birthday of Louise Vanderbilt Schieffelin Hewitt (1901-1926), in her memory. 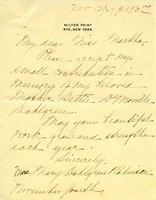 This letter has a $150.00 donation enclosed in commemoration of the donor's mother, Bettie DeMoville. 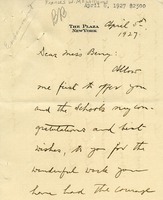 This is a letter from Frances W. McWilliams in which Ms. McWilliams expressed appreciation for Martha Berry's hard work and thus provided her with funding of $2500 for the Berry Schools to use as a memorial. 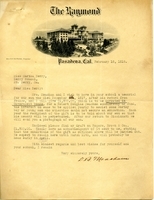 Meacham writes to Berry to establish a $1,500 scholarship in honor of his son, Robert Douglas Meacham, who died in December 1917.